Seismic activity started to rise just as two giant reservoirs on the upper Yangtze were being filled with water. Nature magazine reports on the latest findings by Chinese geologist Fan Xiao, published by Probe International, on the link between mega-dams and seismic activity in China’s southwestern region. Ever since August 3, when an earthquake in southwestern China killed more than 600 people, the Chinese media and blogosphere have buzzed with speculation that the magnitude-6.5 tremor was linked to the filling of two gigantic reservoirs along the upper Yangtze river. Now, a geologist says that he has data to support the possible link. On August 28, Fan Xiao, an engineer at the Sichuan Bureau of Geology and Mineral Resources in Chengdu, reported a rough correlation between the timing of the filling of the reservoirs and a rise in seismic activity in the surrounding region. 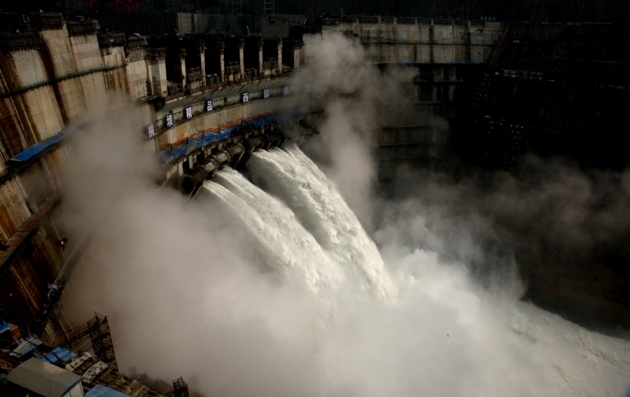 Criss-crossed by active faults, the upper Yangtze region is seeing a boom in dam-building for the [next] generation of hydropower. But when water flows quickly into the resulting reservoirs, it can change the stress on faults deep underground, either from the sheer weight of the water, or when water infiltrates the rocks through cracks and pores. These events might accelerate a fault’s natural ‘seismic clock’, hastening an earthquake that is already building, or increase the chance of one occurring at all. Debate is already raging about whether the 2008 quake in Wenchuan county, which killed at least 70,000 people (see Nature 459, 153–157; 2009) was linked to the filling of Zipingpu reservoir in Sichuan province. Fan was one of the first to raise the possibility, and his suggestion was followed up by other researchers who have reported, for instance, that the reservoir might have brought forward the occurrence of the quake by tens to hundreds of years (S. Ge et al. Geophys. Res. Lett. 36, L20315; 2009). After the 3 August quake in Ludian county, discussion turned to two newly created reservoirs, the nearest of which, Xiluodu, is 40 kilometres from the epicentre (see ‘Of dams and quakes’). His report also flags […] two smaller earthquakes that hit the county of Yongshan in April and August and were caused by faults directly below the Xiluodu reservoir. Xu Xi-wei, deputy director of the China Earthquake Administration’s Institute of Geology in Beijing, agrees that these two tremors were “most likely triggered by Xiluodu”. 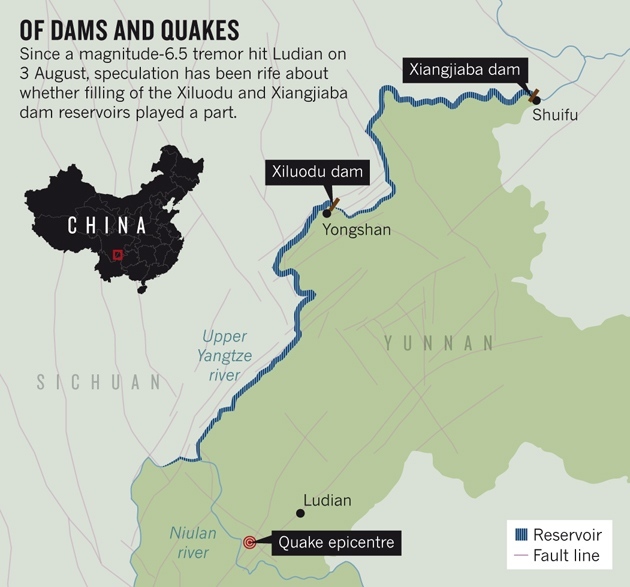 The link between the Ludian quake and the reservoirs is less convincing, he says, because the epicentre is too distant and the initial rupture happened about 12 kilometres down, too deep for water to reach. Researchers including Hu are calling for the dissemination of more sensitive seismic data from the dense network of stations in the reservoir areas, which are tightly controlled by hydropower companies. “This would make more detailed analyses possible,” he says. Fan’s analysis was based on data from seismic stations controlled by the regional government, which are sparse and have less sensitive equipment.